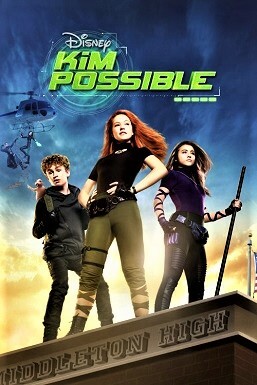 Kim Possible is a 2019 live action Disney Channel original movie about a pair of high school crimefighters Kim Possible (Sadie Stanley) and Ron Stoppable (Sean Giambrone), based on the 2002-2007 cartoon series of the same name. By day the two of them are just regular high school kids dealing with regular high school problems. By night they save the day from supervillains with Kim’s excellent physical skills and Ron’s… Ronliness. Dr. Drakken (Todd Stashwick) and Shego (Taylor Ortega) are hatching their new villainous plans as Kim and Ron start high school. Kim, despite being super-skilled and basically a superhero, is very nervous about high school and it doesn’t help that everything seems to go wrong in the first week, trouble getting to class on time and her sophomore enemy going out of her way to make trouble for her. But things take a turn for the better when she makes friends with Athena (Ciara Riley Wilson) who seems destined to be Kim’s best friends, with many of the same interests and who has idolized Kim for a long time. This movie was a fun callback to the cartoon series, and I particularly liked Todd Stashwick as Dr. Drakken who did a great imitation of the cartoon villain’s voice while making it his own. The plot was okay for a cartoon-based kid show, but will fall apart under the slightest examination. For instance, Kim Possible is well-known and visible on news stories using her real name as a crimefighter, but she is also supposed to be just a regular girl at high school, despite everyone knowing about her crimefighting. And the security issues with having a supervillain-fighting crimefighter going to a regular high school without apparently any extra security precautions. That lack of security apparent in that she carries a grappling hook on the school bus (and can afford a lab full of equipment like a collection of grappling hooks but still takes the school bus). I wouldn’t say the movie’s outstanding, but it is fun, especially if you’re familiar with the cartoon series it is based on.